During the course of my research work, I may obtain results that are worthy of publication in scientific journals. Since my master’s thesis I’ve been using LaTeX as my writing platform, mainly because I can concentrate on content rather than presentation (I find it useful also for writing non-scientific stuff as well). Also, I can handle bibliography (essential for a scientific publication) very well without using expensive proprietary applications (such as Endnote). In my early days I used kLyX first, then LyX, but I found the platform to be too limited for my tastes, and also LaTeX errors were difficult to diagnose. 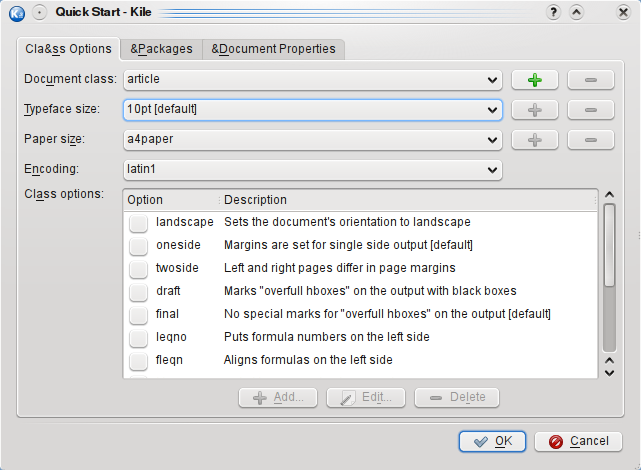 I needed a proper editor, and that’s when I heard of kile, a KDE front-end for LaTeX. 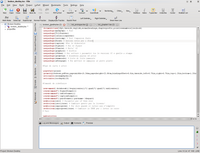 Kile is currently at version 2.0.2 and is a KDE 3 application. 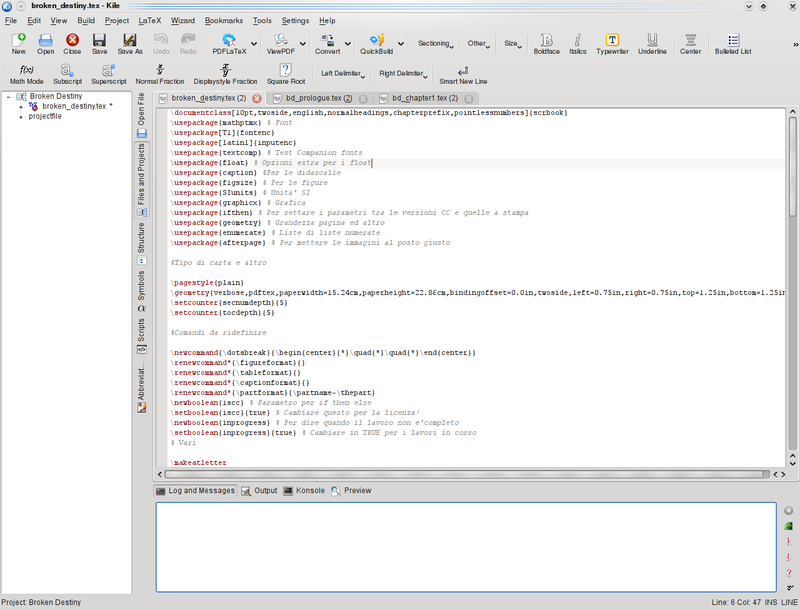 However, in KDE SVN work is ongoing to produce a KDE4 version (2.1) and that’s what I’ll look at in this entry. First and foremost, a disclaimer. kile 2.1 has not been released yet in any form, and so should be considered unstable and crash-prone. That said, it runs more or less well on my platform. Followed by the usual make install as root or using sudo. (For the inquisitive people, it’s not a scientific work, rather a sci-fi like book I’m writing). From the toolbars and the menus you can insert almost every LaTeX command known to mankind. For the people less apt with LaTeX, kile offers a series of wizards in order to make the creation of figures, tables and even complete documents. The one I’m showing here is the Quick Start wizard, which enables you to select document classes, add packages, and add information like author and date. As I was saying earlier, kile 2.1 is still a work in progress, and that explains why the dialog is still a little unrefined. 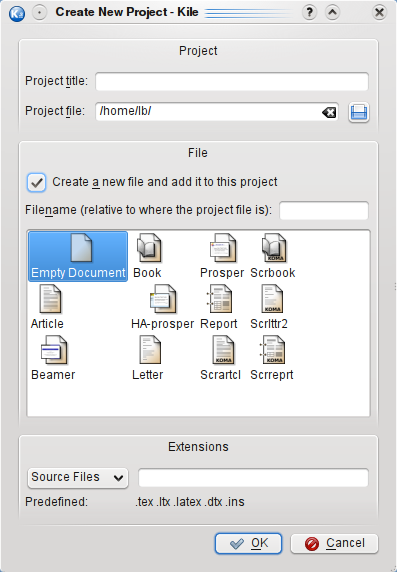 Like with its KDE3 counterpart, kile offers the possibility of using “projects”, which means you can collect LaTeX documents, bib files, and so on, and associate them together. You can also set a master document, so that even if you are editing other files (included in the master document), when you build your LaTeX file the compilation runs on the master document. Even in this case, a wizard helps in creating a project and the master document. Lastly, kile has a plethora of other options, including customizing what you can use to build LaTeX files and view them (DVI, PS, PDF…), as shown in this screenshot. I have merely scratched the surface of this application, which is extremely powerful and can help anyone with their LaTeX needs. While the many options may be confusing, I think that this application is already geared towards a technically-inclined userbase and so it doesn’t matter much. kile 2.1 is still unstable but extremely promising, and I’m looking forward to its release.